JoeTheCouponGuy.com Deals Blog » Blog Archive » OUR TOWN BOOKS NOW $20 WITH FREE SHIPPING! Learn how to save money, find deals, and much more. OUR TOWN BOOKS NOW $20 WITH FREE SHIPPING! Only $20! The 2019 Our Town Coupon Book is now available for $20 with FREE shipping! Save $8! Regularly $28. 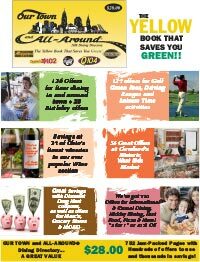 The NEW 2019 Our Town coupon book has over 750 coupons for Northeast Ohio area restaurants, fast food, drug stores, movies, golf courses, pizza, dry cleaning, wineries, entertainment, stores, and more! The BEST coupon book available in the area! It’s like getting 750 Groupons, but all for only $20! Some restaurant coupons are good for up to $30 off! The book can pay for itself with just one coupon! The coupons are good through Dec. 1, 2019! A great bargain! Keep a book in each car. Margaritaville, Bonefish Grill, Brasa Brazilian Steakhouse, Triv’s Restaurant and Lounge, Murano Modern Italian, CK’s Steakhouse, Pari Indian Cuisine, Cafe Piccolo, Chagrin River Diner, Spirits in Willoughby, Lucy Ethiopian, Mama Boy’s BBQ, Harry Buffalo, La Casa Tequila, Don Tequila Bar & Grill Mexican Restaurant, Arrabiata’s Italian Restaurant, The Leopard, Oriole Café, Welshfield Inn, Cowboy Food & Drink, Chesterland Tavern, Chocolate Martini Bar, Mallorca, Tandul, West Park Station Restaurant & Bar, Dubrovnik Garden Restaurant, Shula’s 2 Steak & Sports, Burgers 2 Beer, Granite City Food & Brewery, Skye Bistro, Proper Pig Smokehouse, Corso’s Italian Restaurant, Frankie’s, Fiesta Jalapenos, Olesia’s Place, Rider’s Inn, Slim & Chubby’s Neighborhood Bar & Grille, Yours Truly Restaurant, Dave and Buster’s, Houlihan’s, Ironwood Café, Mahle’s Restaurant & Lounge, Sussex Seafood & Grille, Crepes in the City, Ballantine, Kleifeld’s Restaurant, Local Tavern, Willoughby Brewing Co., The Cabin, Dino’s Restaurant & Bar and more! * SAVE – The book will pay for itself after 1 or 2 coupons. It’s like finding a gift card on every page! Save thousands of dollars! * FINE DINING – 160+ Fine Dining Restaurants with almost all with savings of $10 or more. Most offer half off dinners for those dining alone! Some are valued up to $30 off! * ENTERTAINMENT – Coupons for museums, local attractions, sport-related attractions, comedy clubs, and much more! Deals for Atlas Cinemas, Fun ‘n’ Stuff, Memphis Kiddie Park, United Skates, and more! * LITTLE ITALY – Find a section of Little Italy restaurants such as Guarino’s Restaurant, La Dolce Vita Bistro, Maxi’s, TOLI, and Trattoria on the Hill. * WEST SIDE MARKET – 52 offers for businesses at the iconic West Side Market. * BIRTHDAY COUPONS – 28 FREE dinners on your birthday coupons. * FAST FOOD/PIZZA/CASUAL RESTAURANTS – There are hundreds of “two for one” or “50% off” offers at fast food restaurants, pizza restaurants, and neighborhood favorites. Find coupons for Arby’s, Burger King, Cinnabon, Hardees, Long John Silver’s, Mr. Hero, Orange Julius, Peace Love and Little Donuts, Sonic, Taco Bell, Wendy’s, Around the Corner Saloon & Café, Big Boy Restaurant & Bakery, Buffalo Wild Wings Grill & Bar, IHOP Restaurant, Muldoon’s Saloon & Eatery, Rusty Barrel, Spats Café, TJ’s on the Avenue, Waffle House and tons more! * WINERIES – 35 coupons for wineries from across Northern Ohio including Ferrante, Sarah’s Vineyard, Paper Moon, Markko Vineyard, Hundley Cellars, and Debonne Vineyards. * GOLF – Coupons for dozens of green fees & driving ranges, including Berkshire Hills, Pleasant Hill, and Willoughby Lost Nation Municipal Golf Course. * MISC. COUPONS – Find coupons for IGA (five $5 off $20 purchase coupons), Quick Change, and Granny Anne’s Same Day Cleaners! Get a $25 gift card at Discount Drug Mart with a new or transferred prescription coupon in the book or $15 gift card for a transferred prescription at Marc’s (have them honored as competitors coupons at other pharmacies). * NEW! ADDITIONAL SAVINGS – Find new coupons for Aeropostale, Costco, DressBarn, Firestone, Hobby Lobby, Macy’s, Michaels, and many more! * NEW! SAVEAROUND APP – New app loaded with tons of coupons from SaveAround! * The 2019 Our Town coupons are good now through December 1, 2019! FYI – The book is thinner this year because a thinner paper was used for the pages. This entry was posted on Thursday, February 7th, 2019 at 1:31 am	and is filed under Uncategorized. You can follow any responses to this entry through the RSS 2.0 feed. You can leave a response, or trackback from your own site.